Now days we hear a lot about Raspberry Pi. What is RaspberryPi :: In one line we can say that its small card size computer. But when we say computer it should have monitor or screen, keyboard , mouse etc. It’s basically small CPU (motherboard with Processor + RAM attached). If you want to use display connect to any TV or monitor with HDMI cable, you can use USB keyboard and mouse for input devices. When we purchase any new PC we need Hard Disk to install Operating system like windows/Linux etc here in Pi we use SD card as storage. Now days we get the high speed SD card at good price so we can use good SD card for storage. If you use the Unix operating system without GUI (command mode) then 8 GB is enough still depend on your requirement you can use higher storage. We need to install the OS on SD card, explained in other section. Once OS is ready, we will connect HDMI with TV. Once we connect charger then raspberry pi will boot. you will see linux prompt on screen. I have explained in different pages in Pi drop-down. You can connect USB keyboard and login. Respberry Pi was developed in UK by the Raspberry Pi foundation to teaching the computer to schools in developing countries. Several generations of Raspberry Pi have been released. The first generation (retrospectively known as the Raspberry Pi 1) was released in February 2012 in basic Model A and a higher specification Model B. Improved A+ and B+ models were released a year later. 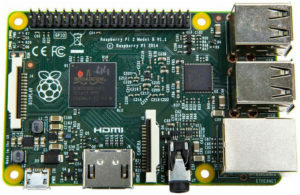 Raspberry Pi 3 in February 2016.